In the aftermath of a slaughter like Christchurch, we are forced, once again, to confront that old question: how can people be marked for murder, not for anything they have done but simply for who they are? It is a question the killer asks himself in his so-called manifesto. A word of warning before we proceed. Readers will note that we are not using the name of the killer in this piece. In this, we follow the argument of New Zealand Prime Minister Jacinda Ardern, who said 'he sought many things from his act of terror, but one was notoriety – and that is why you will never hear me mention his name'. On the other hand, after considerable deliberation, we have decided to quote from his manifesto. We recognise that the content is vile and will be upsetting to many. We do not encourage people to access and read the manifesto without strong reasons to do so (which is why we do not reference the document with details of how it can be accessed). However we do provide a minimum of material which we consider essential in order to understand the actions of the killer, to demonstrate the relevance of wider Islamophobic discourses to the Christchurch massacre, and therefore to help prevent the reoccurrence of such atrocities in the future. Back to the killer's words. ‘Why did you target those people’, he asks, providing his own answer: ‘They were an obvious, visible and large group of invaders, from a culture with higher fertility rates, higher social trust and strong, robust traditions that seek to occupy my peoples [sic] lands and ethnically replace my own people’. So the victims were killed for being Muslims in New Zealand and the gunman acted on behalf of what he saw as his ‘own people’. Who his own people are is not clear from this passage. But it is made explicit elsewhere, when the killer explains who he is: ‘I am just a regular White man, from a regular family. Who decided to take a stand to ensure a future for my people’. And he further defines ‘white’ as ‘those that are ethnically and culturally European’. ‘The people’, then, are a racialised group. Christchurch was an act rooted in a world view which divides people into antagonistic racial blocs in which the very presence of the one is at odds with the survival of the other. In this world, the killer positions himself as just an ordinary individual who has chosen to act on behalf of his group. He is no-one special. In another of the questions he poses to himself, ‘do you consider yourself a leader’, he quickly dismisses the thought. ‘No’, he responds ‘just a partisan’. In the terms we have used to explain the psychology of atrocity, the Christchurch killer is an ‘engaged follower’ (Haslam, Reicher & Van Bavel, 2019). That is, he is someone who knowingly and willingly inflicts harm in the belief that he is furthering a valued ingroup cause. Unlike traditional approaches which suggest that such people act through ‘thoughtlessness’ and even unawareness of what they are doing (see Reicher, Haslam & Miller, 2014), we argue that such people act deliberately in the belief that what they are doing is right. ‘Do you feel any remorse for the attack?’ asks the killer. ‘No, I only wish I could have killed more invaders’. But engaged followership is only one half of the psychology of atrocity. For if people follow, who is it who guides and leads them? If the killer is a partisan, an ordinary foot soldier of racial annihilation, who are the generals? To be more precise, who created the worldview in which it could be acceptable or even noble to commit mass murder? We characterise this destructive act of creation as ‘toxic identity leadership’ (Haslam et al., 2019). Where identity leadership in general is about defining the group and how ‘we’ should act to advance the group cause (Haslam, Reicher & Platow, 2011), toxic identity leadership specifically is a matter of defining harm to others as essential to the advancement of this cause. We can only understand Christchurch – and prevent further such events – if we widen our focus from the perpetrator and bring other dimension of identity leadership into the spotlight. Before addressing who the leaders are in the case of Christchurch, let us first consider what such toxic leadership consists of. How, that is, can acts of atrocity possibly be justified as being noble or good? Elsewhere, we have analysed the process as involving five steps (Reicher, Haslam & Rath, 2008). The first two steps involve defining an ingroup and then setting exclusive boundaries such that particular minorities are excluded from the embrace of ‘us’ and become ‘them’. A classic example of this is to define nationhood in ethnic terms such that ethnic minorities are excluded. As a result, these minorities are denied all the forms of solidarity, trust, respect, cooperation and influence which normally derive from being accepted as ‘one of us’ (Reicher & Haslam, 2009). This denial of the positives of ingroup inclusion can be painful, marginalising and disempowering. What is more, once people become ‘them’, we become indifferent to their fate and disinclined to intervene when they suffer (e.g. Levine, Prosser, Evans & Reicher, 2005) But, serious though they are, such things are still a long way from perpetrating slaughter. This takes us to the next two steps. These involve, on the one hand, representing the ingroup a noble and virtuous and the outgroup as a threat to the ingroup. These can both take more or less extreme forms. At its strongest, the argument goes that we live in a Manichean world, where the ingroup represents the sum of all good and the outgroup (which itself is the sum of all evil) threatens to destroy the ingroup. This extreme form characterises Nazi ideology which portrayed Germany as representative of cleanliness and purity (see Koonz, 2005) under deadly threat of destruction by dirty polluting Jews (see Herf, 2008). Once one has reached this point, then everything is in place to take the final step whereby the destruction of the other becomes permissible – indeed becomes an obligation – in order to preserve virtue. This is the logic which Robespierre used in an infamous speech of 5th February 1794 justifying the terror as a means of subduing the enemies of progress: ‘the springs of popular government in revolution are at once virtue and terror; virtue, without which terror is fatal; terror, without which virtue is powerless’ (Robespierre, 2007, p.115). It is also the logic used by Himmler, speaking to Auschwitz Guards in Poznan, praising them for having the strength to do the nasty but necessary labour of mass murder: ‘To have stuck it out and at the same time ... to have remained decent fellows. This is a page of glory in our history’ (cited by Rees, 2005, p.226). In more condensed form, the killer’s guns stand as symbols to his beliefs. They are scrawled with slogans. These include the names of leaders who, supposedly saved Europe from Muslim hordes (Charles Martel, Georgia’s David IV, Sebastiano Venier) the names of recent terrorists who have slaughtered Muslims and African immigrants (Alexandre Bissonnette, Luca Traini) and the names of those who are victims of the supposed Muslim invasion (Ebba Akerlund). ‘For Rotherham’ reads one of the slogans. And the link between ideas and murderous actions is made clear in that is written on the ammunition clip of a semi-automatic rifle. The killer makes clear that his ideas come from a number of sources, particularly from the internet. Some of the sources are obvious. The manifesto is entitled ‘The great Replacement’ – a clear reference to ‘replacement theory’, associated with Renaud Camus, which suggests that mass migration leads to the replacement of Europeans by Arabs and African, many of them Muslim (Froio, 2018). The symbols on the guns reflect tropes that are common in supremacist far right circles. But some of the influences go wider. The notion of immigrants, particularly Muslim immigrants, as ‘invaders’ (with the implicit connotations of otherness and threat) have been used by leaders such as Orban and Trump. The widespread discourse of immigration based on the need for ‘strong borders’ in order to keep out criminals, rapists, drug dealers presupposes ‘our’ vulnerability and ‘their’ dangers (Kelly, 2019). The more general political and media discourse about Muslims does much to emphasise their strangeness, their otherness and the dangers ‘they’ pose in ‘our’ society. Thus, an analysis of five Australian newspapers in 2017 found 2971 articles (some eight a day) referring to Islam/Muslims alongside words suggesting danger (violence, extreme, terror, radical) (One Path, 2018). Closer to home, many will remember the article in which the prominent Conservative politician, Boris Johnson, referred to women wearing the burqa/niqab as looking like ‘letter-boxes’ or ‘bank robbers’. Our point here is not that the likes of Johnson and the relentless negative portrayals of Muslims in the media are equivalent to the far-right ideas of Camus or directly lead to massacres. But nor are they irrelevant. On the one hand, simply by portraying Islam as ‘other’ they impede the ability of Muslims to be accepted and play a full part in society. Moreover, it is as if they unlock the path to Christchurch and usher people in to a place where more toxic voices lurk. It is impossible to massacre people who are ‘us’. Once it has become respectable to view Muslims as ‘them’, and moreover as a potential threat, then it becomes easier to develop these ideas in a genocidal direction. On the other hand, those who ‘other’ Muslims can play no part in resolving conflict and in responding constructively in the aftermath of a Christchurch. That much becomes clear when we turn away from those toxic leadership voices who provided a cause the killer could serve and towards the post-massacre leadership of New Zealand Prime Minister Jacinda Ardern. In the immediate aftermath of the mosque shootings, Jacinda Ardern called a press conference to condemn what she called ‘an extraordinary and unprecedented act of violence’ and ‘one of New Zealand’s darkest days’. There was nothing distinctive about this way of talking about the event. It is expected for leaders to use strong terms in describing and condemning such atrocities – and, in this, the NZ leaders’ words were echoed by leaders in other countries across the world. What made Ardern’s comment different was what came next when she came to characterising the victims. Here she didn’t seek to gloss over the fact that the victims were largely immigrants or that they were Muslim. However, she stressed: ‘they have chosen to make New Zealand their home, and it is their home. They are us. The person who has perpetrated this violence against us in not’. Unlike others, then, Ardern took time to stress that the victims were members of the ingroup (‘they are us’). Hence the attack was an attack on the ingroup (the violence was ‘against us’). The significance of this should be clear. If the starting point for outgroup hatred is defining the ingroup exclusively so as to bar certain minorities from the wider community, so the key step in contesting such hatred is to define the ingroup inclusively so that these minorities are reincorporated in the ingroup. Additionally, if the positive embrace of the ingroup and their concern at any harm done depends upon ingroup inclusion, then the insistence that the victims are us not only makes people care, it heightens their resolve to ensure that no more harm is done. In this regard, it is worth invoking the debate about Poles and Jews in the Holocaust. In a powerful essay, Blonski (1978/1990) argues that, while there were some heroes who saved Jews and some perpetrators who betrayed or killed them, the major issue was one of indifference which derived from the view that Jews were not really Poles. As Rafael Scarf (cited in Polonsky, 1990, p. 194) puts it: ‘if it had been known then that it was not Jews who were burning, but native Polish husbands, mothers, wives and children, the nation’s outburst of wrath and fury would have been uncontrollable, even if they had to tear up the rails [to the death camps] with their teeth’. What Ardern achieved in her initial statements was precisely to orchestrate a transformation from anti-Muslim scares to pro-Muslim care. And she didn’t stop there. 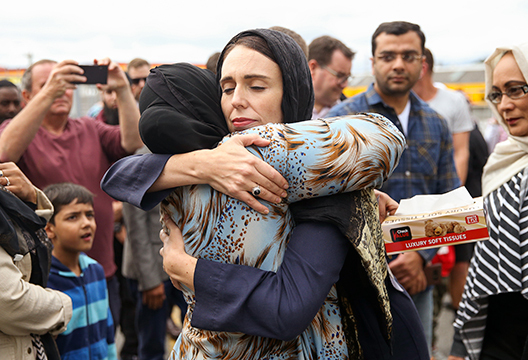 Ardern’s inclusive identity leadership took on a performative dimension when, the day after the massacre, she visited Christchurch. Dressed in black, wearing a hijab and visibly moved, she physically embraced members of the Muslim community. In this simple human gesture, much is accomplished. Through her dress, Ardern (as representative of the nation) signals that Muslims, as Muslims (and without any need to assimilate), are of the nation. Through her sorrow, she indicates that the sorrow of the Muslim community is the sorrow of the nation. Through her embrace, she demonstrates that the entire nation – Muslim and non-Muslim – is (as she put it) ‘united in grief’. The words, though, are superfluous. The silent performance of an inclusive community of solidarity is sufficient. What is more, Ardern’s acts of solidarity and inclusion have not just been symbolic. She has acted to enshrine her arguments in policy and practice. She has pledged to pay funeral costs, provide assistance to bereaved families and to reform gun laws. To use the terms we use to analyse effective identity leadership (Haslam et al., 2011), Ardern has not only been a skilled entrepreneur of identity (building and mobilising a sense of ‘us’) but also an impresario of identity (translating collective norms and values into material lived realities). She has made a great start in healing the divisions and the hurt. But the greatest challenges still lie ahead – most notably how Ardern now deals with her coalition partners, New Zealand First, who believe that migrants should have to submit to test of ‘Christian-based’ New Zealand values (Ewing, 2018). Intergroup hatred and massacres like Christchurch don’t just happen all on their own. They cannot be explained by focusing on the perpetrator alone. For when someone decides to kill for a cause one must ask who created that cause and how they built up the notion that it could be a noble act, a heroic sacrifice for one’s people, to inflict pain, suffering and even death upon others. If there is just one thing we can learn from Christchurch, it is that leadership matters and that the form of leadership that is exercised is critical to what happened. Moreover, the question of leadership turns on what sorts of identities are mobilised. Is it a matter of excluding minorities from the ‘us’ and demonising them to the extent that we are given a choice between ‘them’ and ‘us’? Or is it rather a matter of including minorities within the ‘us’ and making their fate our own? As if to exemplify that contrast, Jacinda Ardern was asked if she agreed with Donald Trump’s denial that white supremacism and right-wing terrorism were problems, she replied with a simple undiplomatic ‘no’. Pushed to say how the US could help in the fight against atrocities like Christchurch, she said ‘Sympathy and love for all Muslim communities’. And that won’t happen as long as these communities are portrayed as unwanted invaders from the outside rather than valued constituents of the inside. - Stephen Reicher is Bishop Wardlaw Professor of Psychology at the University of St Andrews. - S. Alexander Haslam is Professor of Psychology at the University of Queensland. - Jay Van Bavel is Associate Professor of Psychology and Neural Science at New York University. Haslam, S.A., Reicher, S.D. & Van Bavel, J. (2019). Rethinking the nature of cruelty: The role of identity leadership in the Stanford Prison Experiment. American Psychologist. In press. Haslam, S.A., Reicher, S.D. & Platow, M. (2011). The new psychology of leadership. London: Psychology Press. Froio, C. (2018). Race, religion, or culture? Framing Islam between racism and neo-racism in the online network of the French far right". Perspectives on Politics, 16, 696–709. Herf, J. (2008). The Jewish enemy. Cambridge, Ma: Harvard University Press. Koonz, C. (2005). The Nazi conscience. Cambridge, Ma: Harvard University Press. Levine, M., Prosser, A., Evans, D., & Reicher, S.D. (2005). Identity and emergency intervention: How social group membership and inclusiveness of group boundaries shape helping behavior. Personality and Social Psychology Bulletin, 31, 443-453. Rees, L. (2005). Auschwitz: The Nazis and the ‘Final Solution’. London, UK: BBC Books. Reicher, S.D. & Haslam, S.A. (2009). Beyond help: a social psychology of collective solidarity and social cohesion. In M. Snyder & S. Sturmer (Eds.) The psychology of prosocial behaviour (pp. 289-310). Oxford: Wiley-Blackwell. Reicher, S.D., Haslam, S. A., & Rath, R. (2008). Making a virtue of evil: A five‐step social identity model of the development of collective hate. Social and Personality Psychology Compass, 2, 1313-1344. Reicher, S. D., Haslam, S. A., & Miller, A. G. (2014). What makes a person a perpetrator? The intellectual, moral, and methodological arguments for revisiting Milgram's research on the influence of authority. Journal of Social Issues, 70, 393-408. Robespierre, M. (2007). Virtue and Terror. London, UK: Verso.